Preferred Auto Body is a full-service automotive collision repair company.We provide the finest quality service and have an “A+” rating with the Better Business Bureau. At Preferred Auto Body, we believe in high quality repairs, excellent customer service, and a commitment to honesty, safety, and integrity. Our technicians are I-CAR certified, and we provide each customer with a written limited lifetime warranty. Choosing the right shop for your needs is important. Please visit our convenient location and see for yourself why our customers are satisfied. We hope to be your choice for years to come. Ask a friend about Preferred Auto Body! I had damaged my Ram truck (run over an 18″ rock) and took it to Cameron at Preferred Auto. The work he and his crew did made the truck look and feel just like it was new! We are still driving this truck in 2018 and still love it! Tara and Cam were so friendly and helpful. They provided an estimate quickly and followed through with an excellent repair. The car was detailed and looked better than ever. I had an electrical problem that Cam helped me troubleshoot. Then he referred me to his mechanic who completed the repair in one day. Now I have two new businesses to help me in the future. Highly recommended body repair shop! Cameron and his staff are very professional, personable and dedicated to doing professional repair work. Even though my Honda Civic is 12 years old, I love that car and was concerned about the damage from another driver. From giving me an estimate, to connecting with the other driver’s insurance company, to completing the repair work…my car looks good as new and I am one happy camper!!! Fast. Friendly. Professional. No issues. Cam and his staff were a joy to work with; professional, honest, courteous, and with a much appreciated business ethic. The finished work product was perfect. PAB receives my highest recommendation, especially for those of us who’s cars are much more than something that gets us from point A to point B. Thank-you, all! The repair was reasonably priced and completed in a timely manner. The damage is no longer visible. The business owner and his employees were quite courteous and provided me a ride after I dropped off my vehicle. Great service and work. Highest recommendation. Front bumper got shoved back in a parking lot. Hence the clips on the side holding the bumper in place were dislodged (and probably broken). Preferred fixed it very very reasonably and within a few hours (appointment made ahead of time). Highest recommendations on the work well done. They even drove me home and picked me up when it was finished. We took our truck to Preferred Auto Body after the driver’s side was heavily damaged after being hit by another driver. Cameron, the owner of Preferred, made his estimate and helped us contact the other party’s insurance. He was very adept at walking us through the process making the whole thing much easier for us. He arranged to have a rental vehicle brought to his location, again making the whole thing much easier for us. He showed us his estimate and explained it to us. when we went to pick our truck up I was put at ease by great the job Cameron and his crew did in bringing our truck back to its’ original, if not better condition. I have had occasion to use one other body shop in this area and it was no match at all for Cameron’s I can only offer my highest recommendation for the service we received. I was told about Preferred Auto Body by a friend of mine and contacted Cameron. The work performed on my truck was very professional along with the customer service. I appreciate the quality. Thank you all very much. I will do my best to refer you all to as many possible. I was very satisfied with the repair done. I had scratched my door handle and was paying cash to have it repaired. The repair was done quickly and was of good quality. The staff at Preferred are all very friendly as well as professional. Thank you! I have used Preferred Auto Body twice. They were referred by several people in town and I was not disappointed. The work done was excellent. They were very friendly, on time, and kept me informed during the entire process. I will continue to use them if I need any body work in the future. Took a bit longer than promised (4 wks. vs. 2 wks. promised), but that’s the world. Very friendly and professional even when I had to return with 2 follow up issues. I will definitely go to them again. I had hail damage from shipping my car here cross-country. I was so worried that it would take forever to get all of the dings out of it and they would have to replace my trunk and doors. Somehow they were able to get out all of the dings and it looks perfect – I mean perfect! It only took a few days. Being new to town, I didn’t know who to go to so I’m really glad that I selected Preferred Auto Body. They took care of me and the price was fair and they worked with my insurance company too. Went smoothly. I don’t know if this is a family owned business but from the very beginning, it felt as though I was in Mayberry, from the Andy Griffith Show. Everyone was so friendly and helpful. I was rear ended and the whole rear end of my car looks fantastic. I would recommend this business to anyone. They finished in the time that they quoted as well! I had a tree branch fall on the back of my Buick Enclave and took it to Preferred Auto Body to repair. They were extremely courteous, prompt and friendly. Within a week my car was in the shop and 3 days later I received my car looking brand new. I would highly recommend Preferred Auto Body when you are in need of any body repair. We had rear bumper damage due to another vehicle rear ending us. Preferred did an outstanding job in just 2 and 1/2 days. They repaired the damage and it looks just like new. They are very friendly and accommodating. I would and will highly recommend this business to everyone. Cameron Snow is number one in my book. Cleaned protective cover off fender where it was scratched, It looks beautiful and ike new thanks to the great guy who cleaned it off! Amazing!!! Cam was awesome! they did such an awesome job of taking care of what I needed done to my car! All of the staff were friendly. Highly recommended! I was in Prescott for business and got in an accident. This shop came highly recommended. I am not sorry I chose to go with them. They were professional yes friendly and kept me informed on everything going on with the insurance companies, the parts and estimated dates. I picked up my car today and they did an absolute amazing job. Thank you Cam and Matt and the whole crew. Someone had hit and run my vehicle so I immediately drove to Preferred Auto Body. They initiated the insurance claim for me, accommodated my schedule during the repair phase and had the work completed within the specified time frame. Preferred Auto Body is professional and provides consistent and exceptional body work services every time! We were so impressed once again with the outstanding body work done on our car. Got the car back & it was exceptionally clean inside & out, looked like new. Thanks to Cameron & his staff for getting our car back to us by the promised date! I had a hole in my bumper because somebody hit me while I was inside shopping. I went to Preferred Auto Body and Cameron took care of me. He assessed the problem and what need to be done. I told him I wanted a “Bentley” Mesh Grill instead of the original. That was no problem for Cameron . He got it done under price from the quote and on time. Great place to go when you need it. Exceeded expectations. Staff was friendly, courteous, informative and the work was timely done and excellent. PLUS they washed my truck and cleaned the front floorboards prior to my pick-up. Highly recommended! Great service. Easy to work with. They made sure they got everything fix and gave it that little extra touch. They did it all. Cleared with the insurance co. for the repair and the rental car while in repair. The job was done on time and to perfection.. The paint match was superb. I would have no hesitation recommending this shop. This is my first time getting body work performed on a vehicle. The team working here at Preferred were very attentive, very professional and worked with me to get best work and price for my repair. They did an outstanding job and my vehicle was ready on the date quoted. And, when I got in my car I realized that they had not only washed it but had detailed it to boot. Great experience and will recommend to friends. A deer decided to occupy the same space as my Ridgeline, causing heavy damage to the front left fender and bumper. I called my insurance agent and found out they guarantee, for as long as I own my truck, the work of Preferred Auto Body. The staff at Preferred Auto Body were courteous, professional and friendly. Best of all my Ridgeline came back better than new. You can not tell it was involved in an accident. The various body parts are all aligned. The new paint matched the old paint perfectly. I hope I’m never in need of this service again, however, if I am, I will definitely go to Preferred Auto Body. excellent service. received sooner than they had promised. very friendly. Would recommend to friends or anyone looking for a quality auto body shop. We dealt with a horrible shop when we needed a windshield repair (Chino glass) They damaged our vehicle and did a terrible job. We took our vehicle to “preferred Auto Body” and we are so glad we did. Top notch customer service, and they did an amazing job repairing all the damage Chino Glass made. My vehicle looked like new. They even detailed and washed my vehicle inside and out. I will use them from now on always. 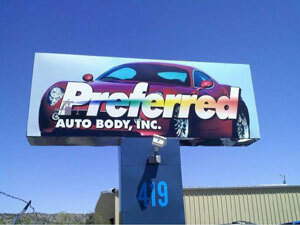 I will be recommending “Preferred Auto Body” to everyone I know. This is the experience you expect and want. They did an excellent job, the car was ready when promised and it was even washed when I picked it up. Actually, I only have the one car so when I took it in someone took me home and gave me a ride back to the shop when the car was ready. I would definitely use this shop again if I needed body work performed on a car. Preferred Auto Body restored my truck after an accident. The work was perfect. They also installed a custom grill for me. Looks great. Great people too. They spoke to my insurance and handled the payment so all I had to do was drop off the truck. They got it done in a few hours. I’ll definitely be using Preferred again should the need arise. The personnel were very knowledgeable, courteous, and very willing to accommodate me. the price they gave me was very fair and they had the truck completed to my satisfaction on the day they said they would. The work was excellent and I will refer other friend to this body shop. Preferred did an outstanding job as always. I’ve taken all of my cars to them over the last several years and they’ve treated me with the most outstanding service. The repairs are always done on time and to perfection. The people who own and work at Preferred Auto Body, special kudos to Cameron and Lola, have been very professional, compassionate, pleasant, and helpful, and I must say, I was astounded to see my vehicle when I picked it up after they’d repaired all the damage done by the unfortunate vehicle versus deer encounter last month. You want to look at everything when you pick your vehicle up after something like that, but you don’t want them to think you’re questioning all they did, so I just looked at the outside, body work, when I picked it up. Once home, I opened the hood and even under the hood, everything looked amazing. Plus, they had my Santa Fe cleaned, both inside and out, seemingly removing all trace of any of the trauma of “that day”! Thank you to a class act, a truly caring group of people who obviously take pride in what they do and really deliver! I so appreciate having them and a place like theirs I know I can depend on to get the job done right, and help me feel safe to get back in my vehicle knowing they’ve done everything possible to repair and restore the original integrity of my car. Whether you need major or minor work on your vehicle (inside and/or out), trust me when I say, you can trust the people at Preferred Auto Body in Prescott! Thanks Cameron, Lola, and all the others who worked so hard, to put me back on the road in my own vehicle! You can count on me sharing with others…we all know “word of mouth”, is the best advertisement! Thanks again! Excellent experience! Took car in for quote to replace front bumber cover. Fast and fair. Finished job was excellent – Good as new. Took less time than estimated. A pleasure to work with and the only place I will take my body work. The guy over at Preferred did a AWESOME job. I hit a tire down in Phoenix and they got it into the shop the next day, They got the parts quick and got it back to me a lot sooner than I expected. Everyone there went over and beyond especial when dealing with the insurance company. They car turned out great looks even better than it did before the incident. If you want Great Honest work these are the people to get it done!! My Volvo with less than 2600 miles was hit while parked and required repair and paint to the length of the driver’s side of the vehicle. I took it to 3 body shops for an estimate. I selected Preferred Auto Body because Matt did a very thorough job of examining the damage and addressing all my concerns. Lola who works in the office scheduled my repair, offered to arrange for a rental car (not needed) and said she would drive me home when I brought in my car. My vehicle has a metallic paint and Preferred did outstanding work. The metal repair is flawless. When I dropped the vehicle off I was told when it should be ready and it was ready as predicted. It was clean both inside and out, had a protective exterior coating, washed and thoroughly cleaned inside. Lola is a gem. She’s cheerful, accommodating and knows her stuff. This is an exceptionally professional group of folks who provide excellent service! Great work finding parts no longer available from Chrysler! Beautiful, timely repair of a favorite vehicle. Preferred is friendly & professional… THE BEST!!! Did an excellent job repairing both the right front and read fender. Highly recommended for courteous and professional service. Job started on scheduled time and completer on schedule. Matt and his team have repaired our vehicles for many years and have always handled the process professionally while maintaining a small town friendliness. The new bumper work on our 2012 Volvo looks perfect. We strive to provide the best experience for every customer who visits our shop. We’re pleased that the work provided on the doors was done to your full satisfaction. However, when the vehicle was brought in, the bumper had pre-existing damage, which we did not address or attempt to fix. We regret that you have unresolved concerns and thank you for your review. All reviews help us to continue to evaluate and improve our systems and service provided to our customers. Excellent customer service, excellent workmanship and very friendly and helpful people to work with. They are very accommodating and easy to work with. I highly recommend this shop. Excellent service. Professional and kind staff. Exceptional repair and detail. Very friendly and helpful owner and employees. Cannot even tell that the car was damaged. I highly recommend this auto body shop. Excellent work and service. Would recommend to friends and family. Preferred Auto Body did a great repair on the front passenger door of my 2012 Ford Edge. The entire door was replaced with a new one and perfectly color matched and blended. Most impressive to me is that the door gaps and stainless trim are correctly aligned. I would recommend Preferred Auto Body to anyone needing a really professional body shop with reasonable rates. My 2003 corvette recently had a tear in the front clip, went to preferred auto body in Prescott Arizona on a reference from the local Chevy Dealer. left the car with them and Cam and the guys did a great job, Lola runs the office and she was great as well, she always kept me updated on the car, Great shop. Kudos guys, thanks tons Jim R.
Friendly and helpful staff. Excellent repair. They even vacuumed and washed my car as part of the service. Highest praise for their work. Cam and his staff were great to deal with. The transport company damaged our Camaro on the trip to AZ, and we were so upset, but Cam assured us that she would look good as new, and he was true to his word. From the estimate to pickup, they were so easy to work with, and our car looks great! I highly recommend Preferred should you need a body shop. Wonderful experience. They are friendly and is great being able to trust that they will perform quality work. All of the staff was very professional and friendly. They called several times to keep me updated on their progress. My car returned in “like new” condition. It was clean and someone had even set my clock (which I had been struggling with for months)! Hopefully I will not need their services again, but would not hesitate to recommend or take my car there again if needed. I couldn’t be happier with my repair.My car looks as good as new. I had never needed to have my car repaired before, but Cameron walked me through it all, and made it easy. He went the extra mile to accommodate my situation and work hours. I won’t go anywhere else. Very honest, excellent work. Thanks Cam! My Corvette looks like new. The paint job is right on. You did a great job both inside and out. I was very pleased with the results and the people I encountered. The employees and owner, Cam, were terrific and supportive. The repair to the passenger door, after a pellet gun shot dented it badly, is perfect. I had had the car (new) only two weeks when the incident occurred. After the repair, it is impossible to tell that the car was damaged. Excellent shop. wonderful people. Preferred Auto Body is my favorite. They do an excellent job and even cleaned my car thoroughly before I picked it up. The repairs were flawless, the customer service was excellent. Any time I need a body shop I go here! Dealing with Preferred is easy and comfortable.Their estimate was clear and complete.They dealt with the insurance company responsible for repairs.All work was done in a timely manner.The whole process was smooth and hassle free. Everyone was very friendly and the service was excellent. Excellent customer service and workmanship. I them in the past have used would highly recommend Preferred to anyone in need of auto body repair services. The entire staff was amazing and made the process of having my car repaired very simple and painless. Cameron and Lola at Preferred Auto Body are by far the most amazing people I have had the pleasure of doing business with. Actually the entire staff at Preferred are friendly, considerate, accommodating and extremely knowledgeable. Preferred has worked on all our cars, several times, over the last 3 years and every time they have gone over and beyond my expectations and believe me I set the bar VERY high!! Preferred has my respect and trust; I could never go anywhere else. Thanks Cameron, you guys are the BEST!!!!! I only had my car for 5 months and was rear ended in a parking lot Needless to say I was very upset. Preferred auto body was able to take my car right away gave me an accurate estimate and returned it to me back to its brand new state. They even cleaned it inside out. Couldn’t be happier, I would recommend to everyone. Matt and his staff are knowledgeable and very friendly. I even got a t-shirt which I will proudly wear! Excellent customer service! I liked that my car was ready a day or two early and was sitting out front when arrived, washed and sparkling. Lots of smiles and loved the puppy office dog too! Excellent, timely repair. The staff are friendly and courteous. They are a pleasure to do business with! Wonderful experience! Customer service is one of their top priorities obviously. Phone calls to keep me up to date on parts ordered and expected delivery dates. Very friendly and easy to deal with. Owner and office personnel dedicated to getting you back in your vehicle and happy. The Best! Customer service is one of their top priorities obviously. Phone calls to keep me up to date on parts ordered and expected delivery dates. Very friendly and easy to deal with. Owner and office personnel dedicated to getting you back in your vehicle and happy. The Best! Wow!!! My car is now perfect, again. Not only was customer service professional but the quality of workmanship was top notch too. The quote for repairs was what I paid when I picked up my car on the day it was promised. I would highly recommend Preferred Auto Body to anyone in need of body work . Customer Service is professional and friendly. Body work was excellent, billed exactly the amount estimated and it was finished when originally promised. They washed my car and gave me a free T-shirt! Would recommend this business to anyone. Listen everyone in Arizona, I have found the greatest people that can fix your car if you’ve had an accident. My wonderful mechanic told me about Preferred Auto Body and he was so right! They are the greatest! They fixed my car just like it was new and all of them are so nice and polite! It is a pleasure to be around them! I want everybody to know about them. They are on Washington St. It’s a family affair and everyone is great. A big thank you to them and I hope everyone goes there! my truck was backed into while sitting and sustained quite a bit of damage to the cab corner and bed. I took it in for claims adjuster to see and Preferred scheduled the work for three days later and told me how long it would take, etc. It was done exactly when they told me, and the work was just outstanding. Paint job is beautiful and it truly looks like a new truck. I am very very pleased and would highly recommend them to anyone. The entire team is amazing! My truck was ready one day ahead of time, and the quality is superb! I will never take my vehicle anywhere else. Outstanding quality and customer service! Repairs were handled in a professional manner and completed on time.Vehicle was cleaned,no over-spray and looks like new.Would recommend this shop whole heartedly.!! Professional and friendly staff, fast and quality work. Repair was perfect! Looks like a new car. All the work was done on time and at the quoted price. Couldn’t be happier. Once again Cam and staff came through. Conveniently, while we were on a short trip they repaired our 4Runner to our standard of perfection; they always do. We have used Preferred Auto Body more than once and are always satisfied. And for a special treat you get to deal with Lola when checking out. Once again Cam and staff came through. Conveniently, while we were on a short trip they repaired our 4Runner to our standard of perfection; they always do. We have used Preferred Auto Body more than once and are always satisfied. And for a special treat you get to deal with Lola when checking out. Absolutely great customer service. The work was done on time and my car looks awesome. Would definitely recommend Preferred Auto Body to everyone that needs body work on his car. They explained the whole process and took care of everything. The damaged area is like new. A very professional job. I was so impressed with Preferred Auto Body, Inc., and especially with Cameron, the owner. He’s extremely knowledgeable, ethical, trustworthy, kind – you name it. If anyone has to select a body shop, select Preferred Auto Body with complete confidence. Thanks, Cameron! Preferred Auto did a great job on my car. I have used them in the past and their work holds up over time. The owner does not play games, what he quotes you when you come in is what you pay later. I would recommend them to anyone. After being hit head on by the dislodged parts of a wrecked car being hauled down I-17 at 75 miles an hour, we took our pride and joy to Cam. He and his crew took the term “attention to detail’ to new heights. They made an awful experience pleasant. We are back to the joy of driving our “vette” again. Absolutely great customer service. The work was done on time and my car looks new. Would definitely use Preferred Auto Body again even though I hope I won’t be backing up into another car again. We had great service from Preferred. They were very friendly on the phone and in person and kept in contact with us about our car. They called the insurance company for us when more work was needed and called the rental company to continue or rental for the extra days. Very friendly organized and our car looked all new when they were finished. Wow, first accident, ever and Cameron really took care of everything. Even had the rent a car people to pick me up when I brought the car in to be repaired. All staff, very friendly and helpful, thank you Lola! Again, this is a great body shop? The owner Cameron is very personable and knowledgeable as well as his office employees, they keep you up todate, no surprises! From the the intial appraisal to the pick up date you can bet that your car/truck will be ready. Cameron and his employees take the time to do the job right. This is not the first time dealing with Perferred and it is a pleasure to drive in and be greeted with professionalism and friendliness. Workmanship was excellent, vehicle look like new, and I would highly recommend Preferred Auto Body Inc.
Everyone and everything about this place was awesome. Great price. My car was beautiful when I got it back (cleaner then when I bought it from the dealer) I had two places on the car that needed to be painted (paint was completely gone) and you can’t even tell it was ever messed up. Can’t give them high enough rating. From start to finish was great. We have taken 2 different cars to them and they have always taken amazing care of us. They are the ONLY place we go. They are the BEST! Fantastic and fast repair of significant damage caused by a tire blow out! These guys are great….answered all questions and delvered early! I don’t normally write references, however, the staff at Preferred Auto & Body in Prescott definitely know how to treat a customer very well and do excellent work…on time. I could not have ask for a better experience given I was pretty upset being run off the road and my vehicle needing reparations. From my first contact with Lola and then Cameron I knew immediately I was in good hands. From getting me set up with a local rental company to excellent communication, it made a miserable situation much easier to deal with. I hope I never have to visit again, but, if the need arises, the folks at Preferred Auto & body will have my business. I’m glad to be able to give a little back to them for a 17 day job well done. Besides…I even got a free t-shirt!! Painless and seamless from beginning to end. Excellent service. Both times we have had our car repaired we have been treated honestly and professionally. We just had an emergency repair (for safety) and it was finished the next day. Fair price and excellent service. The repair of my car after an accident was professional and excellent. Cam and his team are awesome! Not only was my car restored to new it was clean and shiny all over! Thanks everyone! Preferred Auto Body is the greatest company I have dealt with in a long time. When Cam had questions he called me and I felt comfortable calling him when I had questions on the repair of my truck. This auto body shop is The Best. Preferred Auto Body did an excellent job. Got our car back ahead of schedule. Very friendly staff. Very good service. Ready when expected. Work looked great. Got car back very clesn. Would definitely use them again. Great job, done on time, with no added items related to the job coming from the accident. Second time customer, great service!! After having to order the parts for our total front end, the vehicle was done on time. Our vehicle drives like it did when it was brand new, and looks like new. We are very pleased with the job that Preferreed Auto Body in Prescott AZ did on our repair. I will recommend them to all our friends, and anyone who request a recommendation. I took our truck there with a lot of damage, and Cameron and the guys fixed it perfectly. It looked great, they handled the insurance paperwork for me, and called me periodically to update the progress. I would definitely recommend Preferred to my friends, and I’ll be going back if I auto repairs. Great job, friendly people, I highly recommend them. My car had 600 miles on it when it got tapped in a parking lot. I stopped in half way through the job to see how it was going and they walked me out and showed me and explained what was going on. They were doing it it right. Not just masking off areas but actually removing door handle, trim, etc so that the paint looked perfect when they were done. I have been around the auto industry most of my life and was very impressed. Just had some body work done and the result was fantastic. Sure do recommend this repair shop! Our Dodge Hemi was well taken care of by Camarine and his group. We were considering going else where because we needed a rental car. When Cam understood that he got a real nice rental and all the work was done on time and just beautifully. We have never been treated so well by an auto related company. I would go back if ever necessary and would gladly recommend it. Very professional.Also helped with car rental.Office staff friendly.Truck was done on time.Would definitely use again. Fantastic job. The new car had damage from the dealership trying to fix it. After Preferred Auto Body worked on it you would never know it had been hurt. Amazing place and amazing people who genuinely care about your car. So refreshing to have someone I can trust with my cars. 10 stars on a 5-star rating. They did an excellent job on the car and I would highly recommend their work and the employees. I also thought that their charges were very fair and the job was completed in record time. Great job & very customer focused. Preferred auto body did an excellent repair on our van. The dents were gone and the paint was an exact match. Van was ready to be picked up exactly when promised.Employees are great. After smashing into my daughters bumper and thinking it was not worth the cost of repair I happened into Preferred Auto Body. They spent their lunch hour removing the bumper, pulling out the dent using heat and cold and replacing it. You can barely see the old damage. Wonderful customer service with a smile! Thank you Cameron, Lola and the body master! The people at Preferred were very helpful, straight forward and honest. They also took the time to talk about what needed to be done to our car and did not act like it was a bother to give us the time to talk. The work on our car was done in exactly the time that they said it would take and the matching painting job came out very well. It was a pleasure doing business with Preferred. I was very pleased with Preferred Auto Body. They finished my car one day early, people were very helpful and the car looked great. No complaints. Great to work with. Explained everything. Called when changes were necessary. Worked well with my insurance company. Very professional, friendly service. Fast turn around time. Excellent paint work. Car was washed and detailed. Approved State Farm shop so they actually handled the claim directly with State Farm which was great. Would definitely go back again. They were very professional in dealing with me and the insurance company. They kept me informed on the progress/status of the necessary repairs all through the process. The vehicle is “good as new”. Took my car in on Tuesday for a new bumper. Came back on Thursday to a shiny, detailed, newly bumpered Civic. Great shop. Great service. Preferred Auto Body was recommend by my mechanic and I can see why. Their work is excellent and they are so helpful and friendly. Excellent job, courteous and helpful employees, car looks brand new. Very friendlhy and fast service. Took my car to replace the rear bumper on Tuesday and it was done by Thursday, and it looked like brand new. Good job, Cam! Professional and personal service throughout my experience, from the initial estimate to picking up my repaired vehicle. Lola did all the paper work with both the insurance company and car rental company. Recommended by insurance agent after being involved in collision. Pleasant, professional staff. Explained in detail the work to be completed. Drove me home and assisted in delivering a bulky item I had in the vehicle. Repairs were completed on-time. Handled all insurance paperwork. Hope I don’t need auto body services again; but if I do I would be a repeat customer. I would also recommend them to friends. Very pleased with the high-quality work and the professional service I received. I highly recommend this shop! It was awesome dealing with Preferred! They answered all my questions, did exactly what they said they were going to do, and it looks great. All of the staff are very friendly. They finished sooner than expected, and they did 100% of the paperwork with the insurance company! I will definitely go here again, if I ever need repairs in the future!! all work performed very well. i would recommend anytime. Excellent quality work and customer service. Preferred was recommended to me by a friend and I am so grateful for the referral! Matt and Lola were extremely helpful, courteous and kind in helping me with the repairs and insurance claims process. The work was flawless and timely. Much better experience than I’ve had with another auto body shop in town a few years ago. Would highly recommend and would not go anywhere else now for auto body work. Thanks Preferred! Courteous, competent, delivered on time. Car looked brand new, couldn’t see where it had been damaged. I bought my new Fiat on a Sunday. The next Tuesday I was at work, went to lunch, and on my return found that someone had bumped in to my left front quarter panel. There was about an 11″ indent right above the tire. I took my car to Preferred and spoke with Carl. He was excellent! He took a look and explained that they would need to put a new quarter panel on and paint to match my color, copper. It has metallic flakes and he told me it was going to be tough to match. I dropped my car off on Monday April 9th. I was able to pick my car up on Thursday of the same week. How happy I was to see that the paint matched beautifully. It’s tough to have something so new and have it ruined by some moron who wouldn’t fess up. But Carl and team at Preferred made my problem much better by giving great customer service and a quality job. Thanks Carl!!! My car was keyed while I was at work.I got an estimate and had the work completed in a week. This is the third time I have used them on tree vehicles and each time I have been very pleased with the level of service and attention to detail. The color matches have been great, especially when I hit them with a pearl yellow Stealth. The work was done quickly and very well. I would recommend Preferred Auto Body to frieds. Excellent customer service staff, Very very well informed, professional and amazingly quick without any compromise on quality of job. I had a new bumper put on and it was done within 24 hours!!! Perfect job. Price is reasonable and fair. Preferred Auto Body was recommended to me when my vehicle was in an accident. Everyone there was very professional and walked me through all the work that was to be done. Lola was very pleasant to work with and always kept me updated. Thanks for giving my Toyota back to me just as it used to be. We have had this vehicle worked on twice for different items. The dealer where we purchased the Corvette uses Preferred Auto Body for all or most of the body work needed by their customers. We have been very pleased with Carl and his staff on both visits and the car has always been ready when promised, or earlier, and washed before we picked it up. Very excellent service and quick repair. Our family has used them in the past and we’ve always been totally satisfied. Won’t take our vehicles any place else. Great job. Work was excellent and on time. The ability to match paint on new fender to faded paint on the car was EXCEPTIONAL! Have used this company three times and have never been disappointed in the results. Very professional from estimate to finish. Great work done. Timeframe was very acceptable. Excellent service, excellent work, quickly done. Very easy people to work with. Very knowledgeable and courteous. Delivered one day earlier than promised. The work was expert. Very courteous and willing to discuss options. Easy to do business with. It is refreshing to find such a professional company. They did a wonderful job on my Caddy at a fair price. Thanks Carl!!!!! Carl and his crew always do beautiful work. Carl Mueller, the owner, is a stand-up guy. The work from his shop is top notch, I highly recommend Preferred Auto Body. This sevice was for the removal of a couple of chipmunks from the truck & disinfecting everything. I have had paint and body work done at Preferred Auto Body years ago, and it still looks great. Preferred Auto Body does excellent work and I highly recommend them!!! Have had 3 vehicles repaired to our complete satisfaction over a period of 30 years. Highly recommend. We are “repeat customers” of Preferred Auto Body, having used their services several times over a 20 year period. Their staff is always, friendly, extremely professional, and effecient…AND they do a good job of making our auto body problems perfect again. Our Nissan Altima had a cracked/torn front bumper. The staff gave me 3 estimates (used, rebuilt, new) from which to choose in just a very short time. From first estimate to completed project took less than a week of turn-around. Carl and his staff are to be commended in the wonderful job they do. I recommend their shop any time the opportunity arrises. Excellent service that was very timely – bumper repair – in on Monday out on Tuesday! I have known Carl for many years and have had nearly all my body repair work done by his crew. He and Matt are great to work with, completely honest and straight-forward, and their work is always way above average. May not be the cheapest, but Preferred is worth every penny in quality and service! Carl/Matt and the entire shop are top notch. This is the 4th time I have used their services – they are professional and the outcome and repairs are the best! Great Shop and a Great Repair. Looks Brand New! In our 23 years in Prescott we’ve had at least 5 vehicles worked on at Preferred, including restoration work, motorhome body repair, and interior sub contracted upholstery work. All work has been absolutely first class! Very nice and customer friendly. Fast service and high qaulity workmanship. Made dealing with the insurance paperwork easy and complete. An A+ Business. Review: I’ve used Preferred Auto Body four times. A+, absolutely. Both the car and truck came back looking like the nightmare never happened. Won’t go anywhere else. We had a paint problem on the front bumper where it had bubbled and flaked off. The owner, Carl, came out and took a look at it, gave me an estimate and a repair date to fit my schedule. He explained what he thought had caused it. His shop then removed the bumper, stripped the existing paint and repainted. While removing the bumper they inspected it and confirmed Carl’s original opinion. Looks better now than the original. Carl and Lola were very friendly, competent and made sure I was treated the way they would expect to be. It’s nice to meet a owner who takes such pride in his work. Hopefully, my vehicles won’t need his services again. But if they do, I know where I’ll return to. My son hit a deer at low speed so the animal fared better than the front left side panel of the lexus. Carl and his team had the car finsished before lunch, and below estimate. Fair, honest and quick…it doesn’t get any better than that…Kevin L.
We took our car to Preferred Auto Body, Inc and they interfaced direct with State Farm Insurance resulting in a more than fair claim. They were friendly, professonal, efficient and we would not hesitate to recommend them to anyone. Thank for your searching for auto body service in Phoenix, AZ, and Tucson, AZ, areas. We are pleased you've chosen GarageFly to help you with your automotive repair needs. Preferred Auto Body is one of GarageFly's many user rated and reviewed auto repair shops in the Phoenix, AZ, and Tucson, AZ, areas. There are so many choices for automobile repair in Arizona; we feel it's important for you to be well informed. Please visit http://www.preferredautobody.info/ for more information about this automobile repair shop's services.